I think, of all the wonderful produce from near my home in Aberdeenshire, haddock is one of my favourites. It is a wonderful meaty fish and makes the perfect fish supper. Smoked haddock is also the main ingredient of my favourite soup - Cullen Skink. I like my Cullen Skink to be nothing more than onions, potatoes, smoked haddock and cream. It was easy, then, to choose haddock when Dom asked us to choose a local ingredient for this month's Random Recipe. I then turned to my new Nigel Slater book - Eat and looked for haddock recipes. Sure enough, here was this recipe just sitting waiting for me. A very nourishing and filling meal for the family with plenty of goodness from the lentils but also the comforting creaminess of my beloved Cullen Skink. This recipes showcases the beautiful, chunky, flakes of smoked haddock brilliantly. Now I have done the basic recipe from the book, I will be playing about with this and making up my own variations. Easy, healthy mid-week meal. I will hopefully be back soon to talk about some more of the meals I have made from Eat recently. Round Up Of Summer 2013. It is almost time to look out my gloves and the heating has already been put on so really time for me to admit Summer is over. I have mentioned here before that I think Autumn is my favourite time of year. I have already started making chutneys and making more comfort food but I thought I would take a look back over the Summer before I move fully into Autumn. Adam is 6 now and very capable in the kitchen. My parents give them Innocent Smoothies to drink when they are round at their house and, in early summer, Adam saw an idea on the back of one of their cartons for making a caterpillar out of salad ingredients. We got the supplies and he made tea for us. 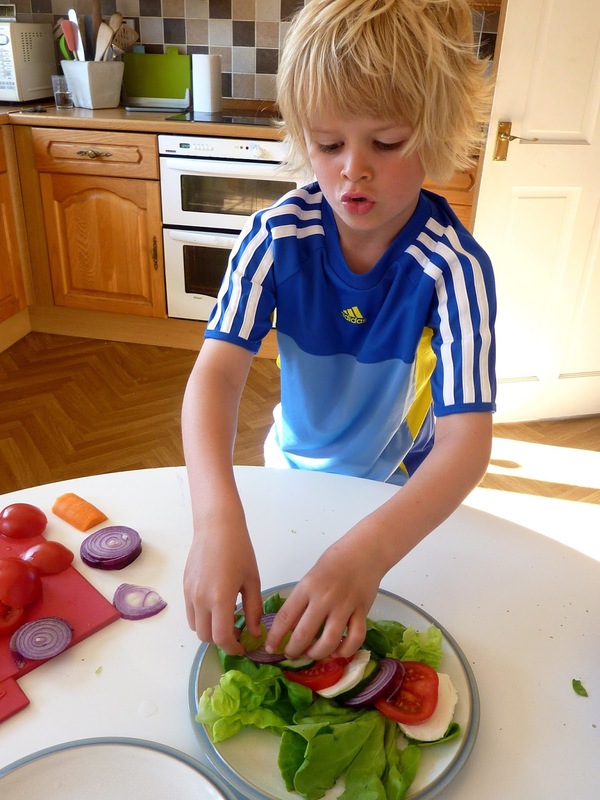 Looking forward to more meals made for us by the kids. We've had brilliant weather this summer. 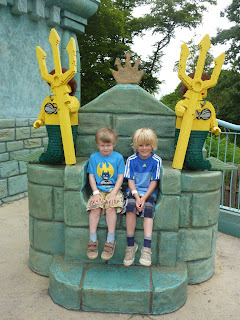 The first week of the holidays, my Dad looked after them the days I was working and took them paddling at the park. At the end of that week we had a very special treat and had two nights at the Legoland Hotel. This was partly for Rufus' 5th birthday but also just because Steve and I have always wanted to go and we felt the boys were at the right age for it. We had just an amazing time. It will always be a very special memory. We then had my Marie Curie Tea Party. And we headed off to Aviemore for a week. We have a timeshare there so do this every year. In fact, my Mum and Dad owned the timeshare before us so I have been going for about 25 years. One thing that started to get to me on my holiday was how awful food on children's menus is. I guess if we are going out for a meal, it is not very often so I don't mind too much if they just have chicken nuggets and chips. However, we cooked very little on holiday so I really started to notice how bad the food is when my kids were getting it every day. Every single place we went to, no matter how different the adult food, had the same awful choice on the menu for kids - basically fried, frozen stuff - chicken nuggets or pizza. And most places don't even offer vegetables. I asked for vegetables every time and everywhere were happy to provide it, but why on earth is it not on the menu? So, one place I was impressed with for their children's food is The Mountain Cafe. We go there now and again when up in Aviemore. The adult food is good and there is a huge selection of cakes. Unfortunately, though, the service when we went this year was terribly slow. Really ridiculously slow and that is after taking into account how busy they were (you always have to queue dow the stairs for a table at lunchtimes during school holidays). We only went once this year because of that which is a real shame as they do make a much appreciated effort with their children's menus. It's a shame I hadn't thought to take a photo. They do some of the boring stuff - chicken strips, pizza, etc but it does come automatically with loads of salad. They also offer things like falafel with hummous and lots of vegetables. The thing my kids like the best, though, is their Kiddies Special. They get a sandwich (on malted bread), chunks of different fruits, a yogurt and a small cake. They also have a lovely selection of fruit smoothies. We'll go back at Easter and hope the service is a bit quicker (you know that way when you see perfectly pleasant teenagers waiting the tables who haven't quite mastered multitasking heading back to the kitchen without thinking to take some of the dirty dishes back with them?). 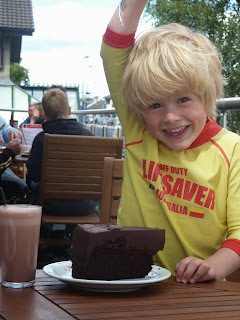 I didn't take any photos this year but here is one from last Summer with Adam and his giant slab of chocolate cake! And, yes, I'm a Mummy who gets on her high horse about her kids getting enough fibre, fruit and veg but also lets them have lots of cakes, biscuits and sweets!! Oh well. 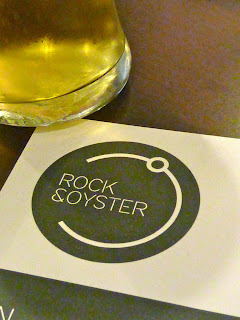 Recently Steve and I also went to the launch of Rock And Oyster - new seafood restaurant in Aberdeen. Aberdeen is a place where we bring in masses of amazing seafood but we actually do not have many decent seafood restaurants so another opening is definitely a good thing! 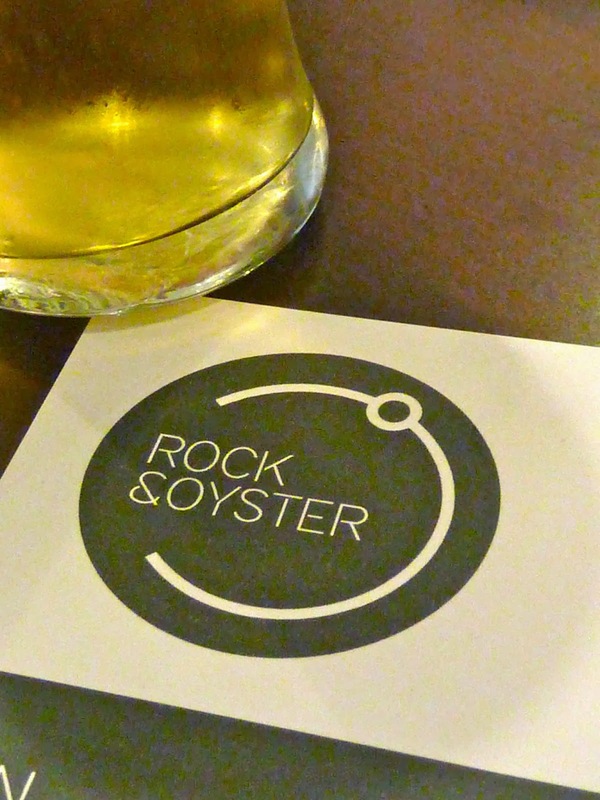 We haven't yet been to eat at Rock and Oyster with our own money so I'm just telling you about the food we got free at the launch so just a heads up! The restaurant is on Union Terrace in Aberdeen and we met up with Chris from Mince and Skirlie and Claire from FoodieQuine at the launch. See cheesy photo of the three of us. Head chef, Ryan Fowler, brought out a steady stream of food - oysters, whitebait, fishcakes, fish pie, mussels... It all tasted good and I was actually pleasantly surprised by the prices - all very reasonable - it's quite informal so you can come in and just have a small plate of oysters for £8.50 or a starter - around the £5 mark and mains £10 - £18 ish. And now, we're in Autumn! Autumn is the best time for eating so I am going to pig out as usual. I have already been stuffing my face with Steve's amazing doughnuts - need to buy some bigger clothes. Random Recipes 32 - Puddings, Cakes And Baking. I'm coming in at the end of the month again but I have a good reason this time. I was invited to a neighbour's MacMillan Coffee Morning today so I left baking this month's entry til now so I could bring some along with me. I had randomly chosen the bake at the start of the month and it was Lemon Bars from The Hummingbird Bakery Cookbook. 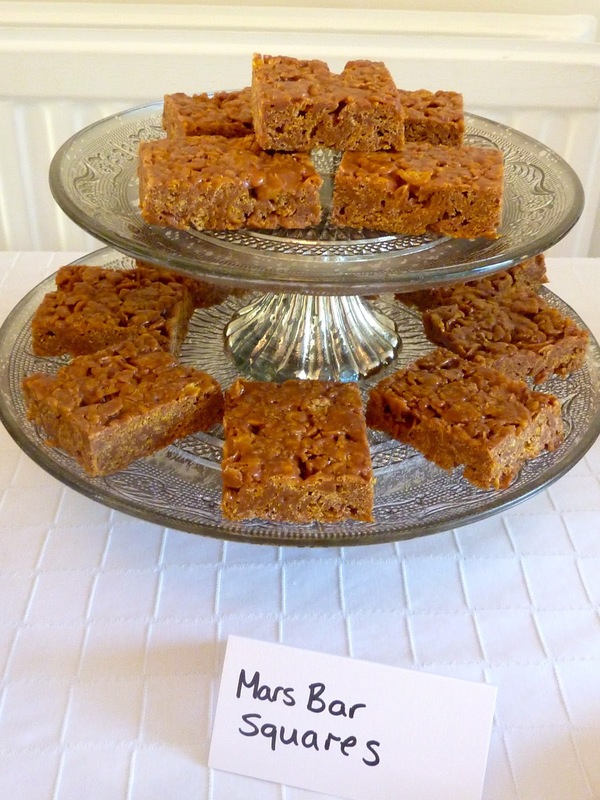 They were very quick and easy to make (although need refrigerated overnight so need to make them the day before). I quite enjoyed them but they weren't just tangy enough for me even though I had put in more zest than the recipe called for. I think if I make them again I will probably try a lime version. They are really a shortbread base blind baked in the oven then the topping is put on - eggs, sugar, lemon juice and zest and baked again. Easy and simple. I also made a pumpkin and chocolate loaf - mentioned this here. My neighbour had done a lovely spread - cupcakes, pancakes, meringues, millionaires shortbread. She had done a raffle and a 'guess the birthday of the teddy' too. She had made about £300 by the time I left halfway through so she has done amazingly well. 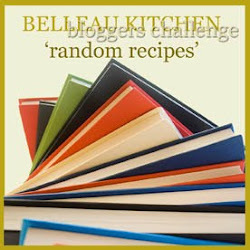 Go to Belleau Kitchen to find out more about Dom's Random Recipes. Eeek. I have 10 seconds to choose ONE cookbook. Just one? I thought this would be easy. 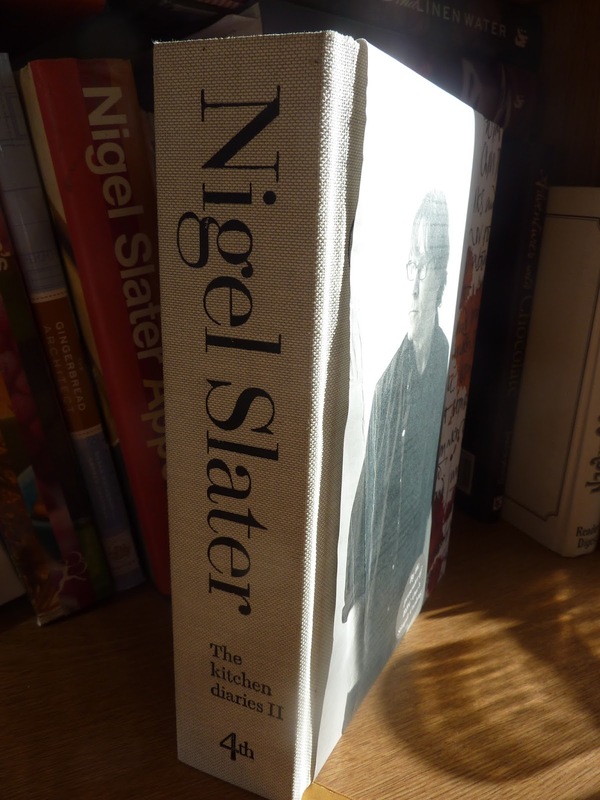 I thought I would just choose the book I always say is my favourite - Appetite by Nigel Slater. However, I actually can make all the things I like best from that book without having to refer to it anymore. When I have to refer to recipes for some of the dishes I make often, I realise there is one or two each in a whole load of different books. So, how do I choose just one book? Dom from Belleau Kitchen challenged us to make a Random Recipe from the book we would grab if we had to flee from the house. In the end, I chose one that I refer to frequently at the moment. It gives me inspiration for the season and lots of ideas I can dip in and out of. I chose Kitchen Diaries II by Nigel Slater. Well, it had to be one of his books. Even if I didn't make the recipes from it, just reading his thoughts on food will inspire. I decided not to choose entirely randomly but to choose the recipe on the page for the date I would be making it. That means it was still a mystery recipe to me but would be perfect for the season. I made the meal on the 7th of August and the recipe on that date is for Smoked Salmon and Cucumber Spread. This was a nice, easy throw-together recipe. 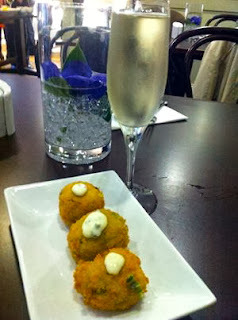 We had it for our tea but it would make a lovely lunch or a nice nibble with drinks. Smoked salmon, cucumber, capers, cornichons and dill mixed with a lemony soured cream and then piled onto crispbreads. Funnily enough, we happened to have a couple of packets of crispbreads from Ikea in the kitchen and these worked very well. Now, I knew I had to get Steve involved in this one. His favourite book is Moro and he does most of his cooking from it so I reckoned I would get a new Moro dish if I involved him. It took his less than a milisecond to say the book he would grab would be Moro. My husband is very predictable. He opened it randomly and did indeed get a recipe he hasn't yet tried - Broad Bean and Dill Pilav. It was served with a spiced yoghurt. We had it as main meal like that and then had the leftovers the next day as part of a cold salad selection and it was great both ways. Moro recommends serving it with lamb kibbeh. They have a recipe for this later in the book and they describe it as "an oval outer casing of ground lamb and bulgar with a stuffing of spiced lamb and pinenuts inside". Sounds good to me - something new for Steve to try? There are actually still loads of things in the book Steve hasn't tried yet. Hope next month's random recipe theme will encourage him to do more. 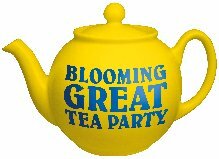 Marie Curie Blooming Great Tea Party. Well we had our Blooming Great Tea Party. We had a really lovely day. A good few friends, family and neighbours popped in for a cuppa and some home baking and, as it was a beautiful day, we sat in the garden and had a good natter. 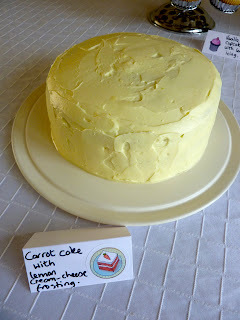 And as an extra bonus, we managed to raise just over £300 for Marie Curie Cancer Care so I am delighted. I kept the baking simple and tried to have something that would appeal to everyone. I also tried to make a mixture of things that could be made in the days leading up to the event so I wasn't trying to do everything last minute. Here is my baking schedule just in case it helps anyone else who is new to baking and wants to do a tea party. I started with the cookie doughs. I made two types of cookie (well, Steve made one of them). We did a rye and raisin one from Dan Lepard and a peanut butter and chocolate chunk one from ... We made the doughs then scooped out balls of about 30gs each of the mixture, rolled into balls, froze flat then transferred into bags to keep in the freezer. These could then be just taken out, popped onto baking sheets and baked for 12 minutes to give fresh cookies on the day. About 3 days before the tea party, I then made shortbread and kept this in an airtight container until needed. 2 days before I made batches of cupcakes from Cupcake Magic (for recipe - see this post), my three carrot cake layers (Dan Lepard - recipe here) and a batch of Mars Bar Squares. On the day before, I iced and decorated my cupcakes. 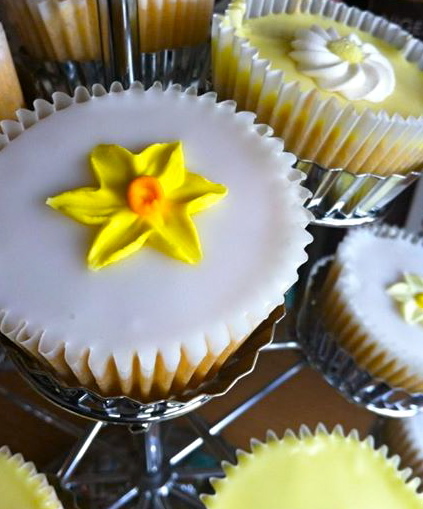 I must mention here the gorgeous daffodils I bought for the top of my cakes for the Marie Curie theme. I got them from carolsyummybakes which I found on eBay and I have to say that she couldn't have been more helpful and I was seriously impressed with the quality of the decorations. I iced the carrot cake with lemon cream cheese frosting and kept in the fridge. 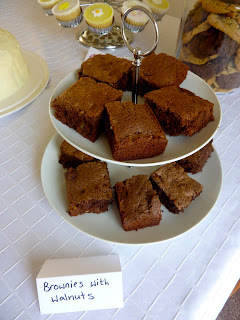 I made two batches of brownies (one with and one without walnuts) and two lemon drizzle cakes. 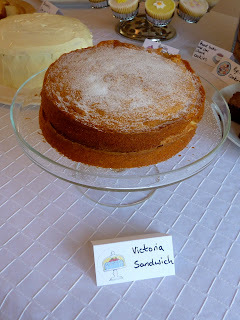 On the day itself, I made a Victoria sponge and laid everything out for a 10am start. I had plenty of baking - too much in fact - and everything seemed to go down well. This was my JustGiving page and if I add all the donations given to me on the day, it comes to just over £300. Very happy to donate to such a brilliant charity. Thank you so much to all my family and friends who contributed. 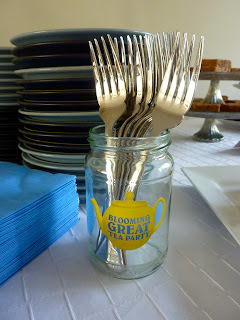 I had a wonderful day and would recommend having your own Blooming Great Tea Party either this year or next year. See the website for details. This is my 30th Random Recipe. I haven't missed a single one (although I have been a bit tardy on occasion) from the very start of Dom's successful challenge. For the occasion, Dom asked us to count along our recipe books, choose the 30th one and cook whatever was on page 30. My 30th book is Roast Figs Sugar Snow by Diana Henry - a beautiful and inspiring book given to me by my dear friend. A lot of the recipes are warming, comforting dishes for wintertime but luckily page 30 gave me a salad so it was fine for the glorious temperatures we were getting here at the start of the month. The recipe was for Salad Of Pear, Hazelnuts And Cashel Blue Cheese. I varied it slightly by using gorgonzola instead of the Cashel Blue and pecans instead of hazelnuts only because that is what we had in the house. The salad is a lovely, filling one. It uses roasted red onions as well as a mixture of salad leaves and the meltingly sweet pears to go with the nuts and cheek-sooking cheese. Sometimes my older boy will turn up his nose at "smelly" cheese but my relentless foisting of it upon him is obviously paying off as everyone in the house finished off their salads with clean plates. My kind of Summer meal. To take part in Random Recipes, see Dom's Blog - Belleau Kitchen. You will receive a very warm welcome. 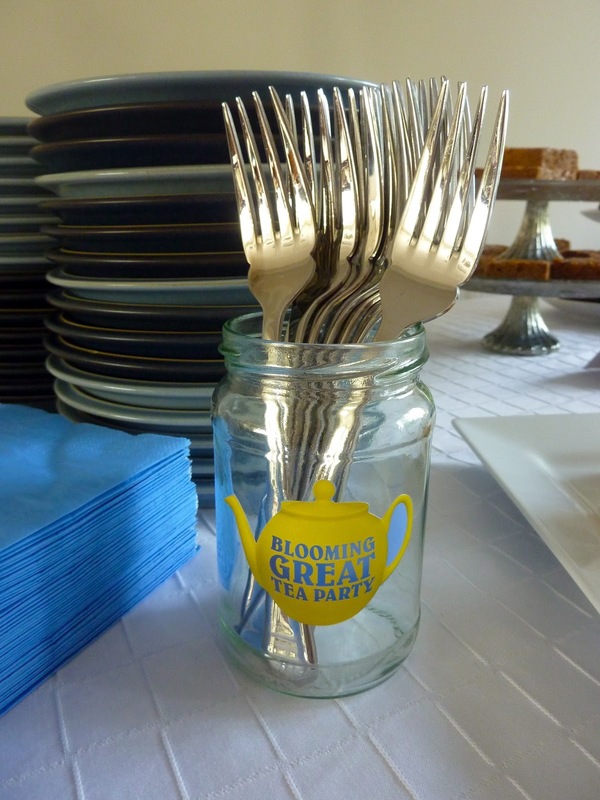 Blooming Great Tea Party and The Best Cupcake Recipe. I just wanted to raise some awareness of Marie Curie Cancer Care's Blooming Great Tea Party campaign. 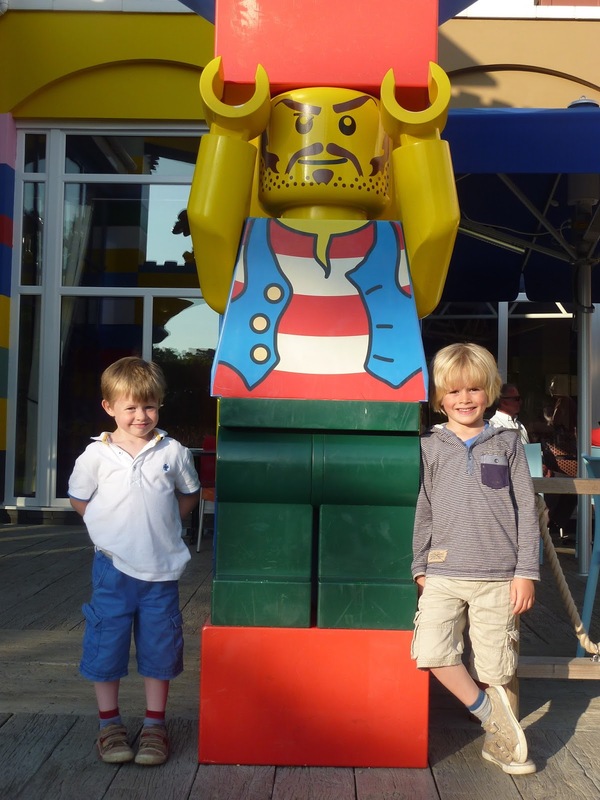 They are hoping to have thousands of people (4909 have signed up at the time of me writing this post) up and down the country to host tea parties to raise funds for such an amazing charity. I am hoping that some of my readers may see this and decide to host their own one. It's such a lovely idea. I am hosting my own party at home on Sunday 21st of July. The official time for the tea parties is June and July but some people still host parties into August so there is plenty of time for you to plan one. You can do one at home, in your workplace, in the local hall, anywhere. You can have you and another person at the party or you can invite thousands. Whatever you feel you can do will be perfect. You can sign up to do one on the website and the charity will send you loads of useful things to help with planning your party. The idea is to raise some money for this wonderful cause. 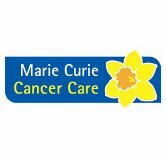 Marie Curie Cancer Care uses the donations for cancer research and development, for hospice beds and for funding Marie Curie nurses who are a hugely valuable support to patients with terminal illnesses and their families. As a GP, I see the good they do every single day. I can't overstate what a huge difference they make. If you feel you can't host your own party, please consider making a donation to Marie Curie Cancer Care. You can do so through Just Giving or you can donate to my page set up for my own tea party. I am busy planning what I am going to bake for the day. I am thinking I will do a Victoria sponge, some cookies, brownies, lemon drizzle cake and lots and lots of cupcakes. 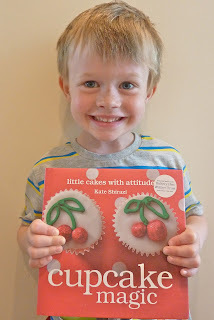 I have mentioned before that my basic cupcake recipe comes from Cupcake Magic by Kate Shirazi. This book so inspired me when I picked it up about 5 years ago and I thought, "I could make some of those". That started me baking more regularly and trying new things. My husband always says he wishes he had stopped me buying Cupcake Magic as it has led to me getting slightly obsessed and having a house full of sprinkles and cupcake cases and cakestands! 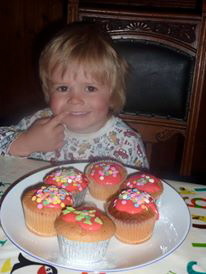 However, secretly, I'm sure he's glad that I got my new hobby and started feeding him lots of lovely cakes. 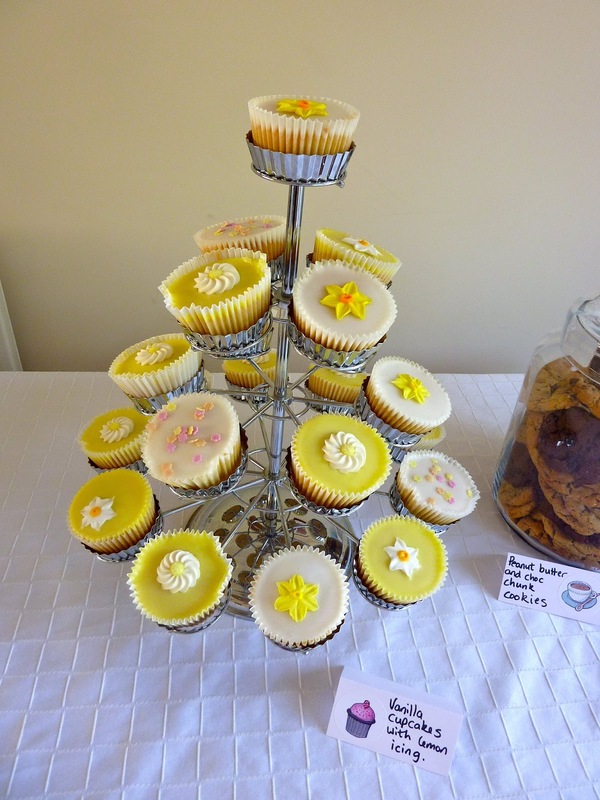 One of the things that attracted me to Cupcake Magic in particular was Kate Shirazi's support for the Battery Hen Welfare Trust (a donation from each book sold went to them) and stories of her own rescue hens and photos of them enjoying her cupcakes. 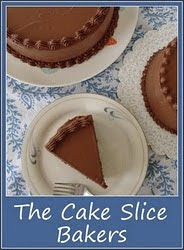 Have a look at Cakeadoodledo to see her cakes for sale, her other books and her blog. Anyway, I know her basic cupcake recipe off by heart and can whip up a batch with my eyes closed. They are so easy and yet very tasty. This is the perfect recipe for those new to baking. Kate has very kindly allowed me to reproduce the recipe on my blog and so I am going to share it with you here. I think that might be worth a donation to Marie Curie Cancer Care - no? 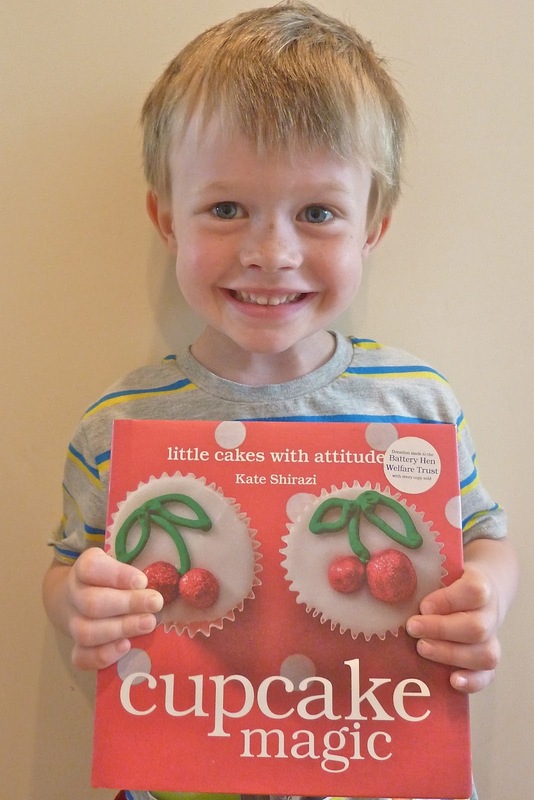 Recipe - Your Basic No-Mucking-Around Cupcake from Cupcake Magic by Kate Shirazi. Glace icing and sprinkles to decorate. Preheat the oven to 160C/325F/Gas mark 3. Line a 12-hole muffin tin with cupcake cases. Put all the ingredients (except the icing and sprinkles, of course) in a mixer (food processor, stand mixer, or just a big bowl with an electric whisk). Mix really well until the mixture is light and fluffy. Plonk heaped teaspoons of the mixture into the prepared cases, and bake in the oven for about 20 mins until golden, and firm and springy when you give them a light prod on top. Let them cool before icing and decorating. 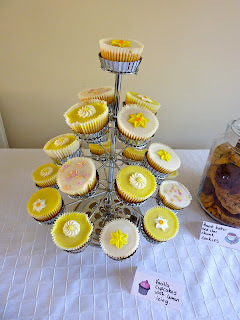 And, look, I don't have any decent photos of any of my batches of these cupcakes which is, quite frankly, a bit weird. In fact, I just dropped off a batch of these to my Grandma today for her 80th birthday and wish I had taken a photo - they were very pretty. 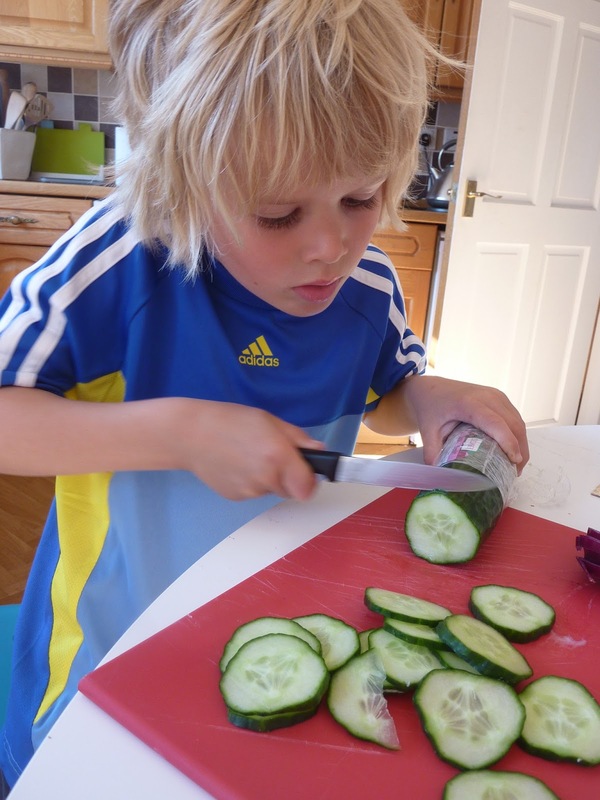 However, here is a photo of Adam when he was about 3 making a beautiful batch! I will take photos from my Blooming Great Tea Party and will post here. Please let me know if anyone else is doing a tea party - I'd love to hear about it. In the meantime, here is a link to Foodie Quine's Tea Party from last year. Learning to cook and bake for my family. Wagamama Cookbook - Warm Stir Fried Chicken Salad. Cake Pops 3 - Lions.